This cake is decorated with Cattleya Orchids in two shades of Lilac, yellow miniature Cymbidium Orchids, Roses in two shades of pink & dark pink Blossoms. 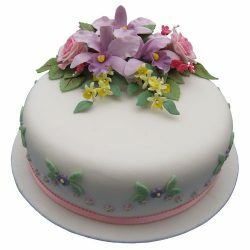 Blossoms & Leaves have also been applied to the side of the cake. 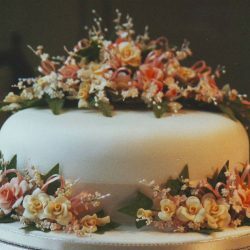 This celebration cake is decorated with pink Roses, Carnations in shades of orange, pink & lilac Hydrangeas, and Blossoms. It has been placed on a silver drum & finished with a white ribbon around the base of the cake. 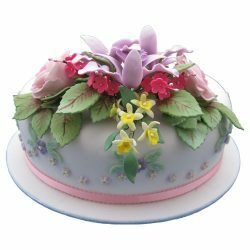 This fondant covered celebration cake is decorated with a large number of small yellow & pink Roses, white & pink Blossoms, Ivy & Fern Leaves. It’s placed on a fondant covered board & finished with a wide pink ribbon. 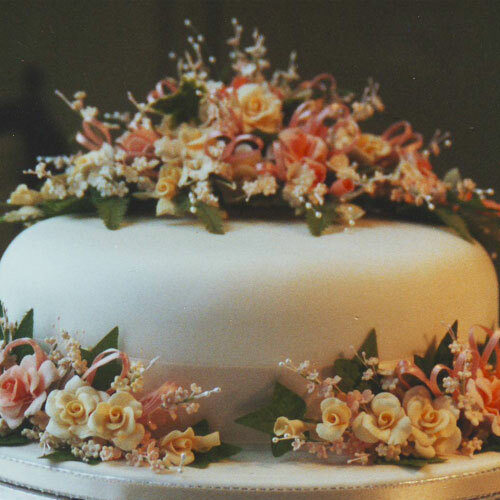 This celebration cake is decorated with Cattleya & Cymbidium Orchids, Roses, Rose Leaves & Blossoms. 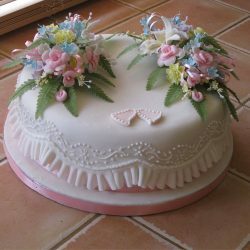 The cake is covered in rolled fondant & the side is decorated with Blossoms & Leaves & finished with a narrow pink ribbon. 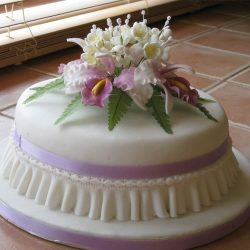 This cake is decorated with shaded purple Cattleya Orchids, white Blossoms & Fern Leaves. 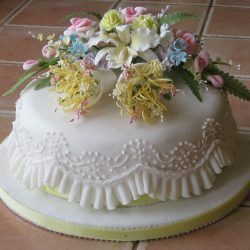 The cake is covered with rolled fondant & finished with a Garrett Frill & lilac ribbon. The cake board is also finished with a lilac ribbon. This fondant covered cake is decorated with pink Roses, yellow Carnations, blue Blossoms & Fern Leaves. 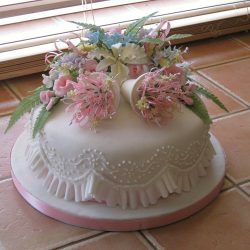 The cake base is finished with a pink ribbon underneath a scalloped Garrett Frill and then piped with Royal Icing. 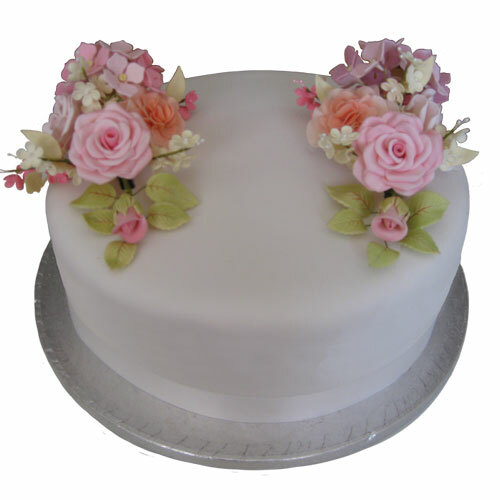 This celebration cake is decorated with pink & yellow Roses, pink & white Blossoms & Fern Leaves. 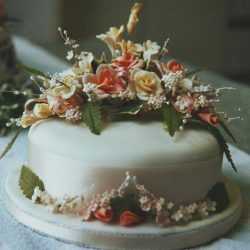 The side of the cake is finished with extra wide satin ribbon, Blossoms, and Rosebuds. The fondant covered board has a matching ribbon. This cake is decorated with pink Roses, white Cattleya Orchids, Fern Leaves, Bells & Blossoms. Pastillage is used to make the Bells, which dries hard, keeps its shape & is resistant to humidity. The cake is finished with piping and a Garrett Frill. This cake is decorated with pink Roses, white Cattleya Orchids, Fern Leaves, Bells & Blossoms. The Bells are made of pastillage because it dries hard, keeps its shape and resists humidity. The cake is finished with a scalloped Garrett Frill.